Old Temples blend with commerce and the bustle of daily life in the city center. Tainan is the oldest city in Taiwan. It was the site of the main Dutch colony on the island, and after their defeat it became the country’s first capital under Chinese supervision. It was the capital of the island from 1662 until 1887 when the capital made a brief appearance in Taichung before settling in Taipei. The Japanese did a lot of urban planning and restructuring of the city in the early part of the 20th century, but since then, the city has become more of a historic tourist destination than a cosmopolitan hub. Find treasures down any random alley. At first glimpse, many people are a little disappointed when the see Tainan. It’s reputation of being the Kyoto of Taiwan feeds a lot of romantic images of a bygone era. Most buildings in Tainan are anything but historic and many streets are the same 7-eleven-filled streets found anywhere on the island. But after visiting a few temples and wandering down a few winding alleys, most people are really taken by the city’s charms. It really is a culture-rich and traditional city, and rarely a week goes by without some special religious celebration or parade. Tainan is known for its history, temples, traditional lifestyles and traditional snack food. It sees a lot of domestic tourism around holiday times, but not much international tourism. By some accounts, there are over 500 Buddhist and Taoist temples within city limits. Many of these are among the oldest and most important in the country. 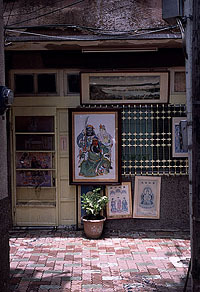 Tainan has eight first class National Historic Sites, eight second class, thirty-seven third class, and numerous “city class” protected heritage sites. Tainan has a population of about three-quarters of a million people, making it the fourth largest city in Taiwan. The downtown area is fairly dense, but it spreads out into low-rise sprawl very quickly. Sky-rise apartments of around 14 stories are popping up everywhere, but throughout much of the city the buildings are between two and five stories. By Asian standards it is a small city and has a small-town feel to it. People from Taipei refer to it as the countryside. Even in the heart of the city, there are still many low-rise buildings. The city is completely flat and much of it is below sea level. It is a coastal city, but the main areas of the city are inland. In the early years, settlements developed on both an island that is now Anping, and in what is now the historic areas of downtown Tainan. The older parts of downtown were once along a harbor, but steady silting filled in that area and now Anping is no longer an island. Much of the silted land has become a rich ecological area and has been designated a protected national park. 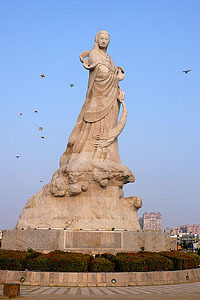 At Lin Mo Niang Park, the goddess' statue watches over the sea. Tainan is south of the Tropic of Cancer. Like most of Taiwan, it has a subtropical climate, but Tainan borders on a tropical wet-dry sub-climate. It enjoys a mild and dry climate in the winter. December and January are particularly free of rain, and blue skies can last for weeks throughout the winter. November, December, March and April are usually the most pleasant months for most people. Temperatures in January and February can sometimes dip down below 10°C (50°F) for a few days (which feels colder than it sounds due to humidity), though there can just as easily be daytime highs around 25°C (77°F). Jackets and sweaters are necessary for cooler days and nights. Summers can be insufferably hot and humid. The heat cranks up to the thirties (90-100°F – which feels hotter than it sounds due to humidity) around mid-May and stays there until mid-October. The summer is also the wet season and rains are more frequent. Typhoon season is also at this time. Typhoons usually occur between June and November, with the highest number of weather watches coming in August and September. Public transportation in the city is lacking, and most people drive scooters to get around. There is a bus system, but it is under-used and infrequent. Taxis are available and affordable, but you can only be guaranteed of flagging one in the busiest parts of the city. Scooters and motorcycles are the best way to get around as they whip through traffic and narrow lanes with greater ease than cars. You can also park them both more readily and free of charge. Bicycles are good in winter, but you may get sweatier than you’d wish in the summer months. Helmet laws are enforced for scooters and motorcycles, but not bicycles. Many foreigners find Tainan to be a very appealing place to live and there is a well-developed expat community. The nightlife is not big-city, but expat bars can be very friendly and welcoming. Generally, most locals are also very welcoming of foreigners. While many people will go out of their way to help you if you need it, foreigners are very common and it is unlikely you’ll be stared at or doted upon. The government is trying to make the city more international, but there are still not a lot of bilingual signs around. Learning at least some Chinese will make getting around a lot easier. While many young people have learned English in school, spoken English is not widespread. Not many taxi-drivers, restaurant staff, or shop owners will be able to speak much English. Some of the older people don’t even speak intelligible Mandarin, as they prefer Taiwanese. Down every alley there is a temple. Whether you are visiting or living in Tainan, take time to soak up the relaxing vibe and explore the numerous hidden treats that exist all over the city. If you really get in touch with the city’s history, its culture, and its friendly people, you may never want to leave. Tainan will start getting very busy with tourists starting from tomorrow. Anping in particular will be packed. Also note that during the New Years holidays, taxis have an additional NT$50 surcharge. Nevertheless, I’m sure you’ll enjoy your visit. Thank you! This is great information! I will be in Tainan this July and August as a TUSA Ambassador at NCKU…. Any tips? Places that MUST not be missed? How is the hiking? And, what would be a reasonable amount of money to bring for fun and food for two months? The mountains are accessible if you have a car, but a little trickier to get to if you don’t. July and August will be hot, even in the mountains. Two month’s budget? I have no idea. Food can cost as little as US$2.00 per meal or as much as you can imagine. If NCKU is giving you accommodation then you don’t need to budget for that. Staying in a hotel for that long would be pricy, as it would anywhere. Good information, i will there at 1st Mei onwards cause of conference at NCKU. Hopefully makes reality and enjoyable. Your writing is the most refreshing I’ve read in ages. Thanks so much for your exemplary and inspiring blog (or is this a website?!). My husband and I l live in Kinmen, and are using this, whatever it is, to plan a week’s trip to your fair adopted city in early Feb. Thanks for the kind words. I hope you enjoy your visit. Thanks for this great website. I’ll be in Taiwan from Nov.17 to 27, 2016 and was planning to fly from Tokyo to Taipei and then take the HSR to Tainan but after reading your comments, instead may fly directly to Tainan for 4 days as we will be in Taipei for a cultural exchange with Friendship Force International for a week at the end of our stay. Would you recommend using local transportation vs renting a car in Tainan? Is traffic very congested and driving dangerous? Are there any areas of Tainan we should avoid re: hotels and safety walking around? I’m happy you’ve made Tainan a focus on your trip. I’m sure you won’t be disappointed. I don’t recommend renting a car as they’re expensive and impractical in Tainan. Scooters are best if you are comfortable with them. Otherwise you can manage on foot and with buses and taxis. It is safe everywhere for the most part. I don’t know too much about night life anymore, but probably Tin Pan Alley is your best bet. Maybe someone else would have other suggestions. Unless you rent scooters, taxis are your best choice for transportation. They are not expensive, though few of the drivers speak English. It is a good idea to carry around addresses and business cards written in Chinese. Thanks for the kind words. I’m glad the information was helpful. If it were a weekday I’d call the Tainan Foreigner Assistance office at city Hall. I suggest you find someone who speaks Chinese to help you.Try Cheng Kong University Hospital first and work towards smaller northern hospitals from there. The NCKU hospital may be able to help with that. Hi, how is the air quality compared to Kaohsiung? Is it better or is there still a lot of pollution? The simplest answer is that the center of Tainan doesn’t have very good air quality, but the center is quite small compared to Kaohsiung. It is quick and easy to get to An ping and other districts where the air is much better.